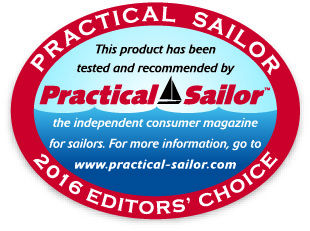 We are so excited to learn that we have received Practical Sailor’s 2016 Editors’ Choice Award for our Dingy Anchor! Of course we always thought our baby was the best, but we are definitely honored that others think so too! Sailors spend considerable time pondering their anchoring arsenal for the mothership, but what about the dinghy? In the December 2015 issue, we evaluated five small, easy-to-manage anchors weighing 2 to 3 pounds.The test field included: the Guardian G5, a scaled-down Fortress; the Lewmar Claw, a descendant of the Bruce anchor; the new Mantus Dinghy Anchor, a scoop-type anchor; a 1.5-pound Seafit Folding Grapnel; and a typical, 8-pound mushroom anchor. leaving the dinghy attached to. We tested the stainless version ($170)*, which features a clever and simple mechanism for disassembly and flat storage. However, the welded, one-piece galvanized version ($48) strikes us as more practical for the sailor looking for a dinghy anchor. *NOTE PRICE REDUCTION: Pricing above is an “anchor only” price. The stainless steel dinghy anchor is now only $128. The galvanized dinghy anchor is $48. We also sell the dinghy anchor in a “kit” with rode and bag.